eyes shifting to the darker green of his wolf self. Paramours growled "sorry I didn't know. Don't have to get your tail in a twist" she grumbled. Her green eyes darkened and she narrowed her eyes. She didn't even mean to be mean. She just asked a simple question. Jake growled. He looked ready to pounce when suddenly he stopped. His eyes returned back to light green, and he held his head. "I'm sorry Paramore. I don't know what happened to me." He groaned, looking back at Raizil with a slight amount of fear in his gaze. Para more chuckled "it's a normal wolf thing. Wolves don't take well to anyone or anything even talking wrong to there pups. I understand" she chuckled. She knew this because of her mother and father. She watched the child and sighed. She wanted a mate and pups. Jake sighed again. "Well, Kenji isn't really mine, well actually he is, but... It's complicated." Jake sighed. He shook his head, irritated. Paramor nodded and shrugged "it's doesn't matter. Your wolf had claimed him as yours" she said. She knew about this stuff. She smiled "I think you will be a great father. Let's hope he likes electricity" she smiled and held up her finger. A small bolt of electricity sparked and chuckled. Indira had remained quiet as the three wolves spoke. It would be bad if she were to stay here any longer and be tempted to join this pack. After all, she was but one side of a coin and if the other side flipped, well, let's just say things would get very messy. "Goodbye." Indira mumbled respectfully, dipping her head slightly. Shifting into a sandy-blonde wolf with grass-green eyes, Indira looked at the pack once over her shoulder before pacing calmly away back to her apothecary in the village. She had no desire to stick around and explain once again what she was doing in pack territory to the new red-headed wolf. Jakes green eyes shifted to the leaving Indira. He sighed, running his fingers through his air. "I hope so too." He said, sending a small bolt up into the air. He nodded at Paramore, then shifted to look at Kenji and Raizil, a smile on his face. Paramore smiled. She yawned and announced "I am going to Town. Anyone is welcome" but she knew no one would want to go, all of them where caught up in Kenji. She sighed and dashed off. Her red hair flew behind her and she loved it. Raizil handed Kenji to Jake. She then watched in amusement the exchange between Jake and Paramore. "Paramore is right Jake, he is now out child. And I won't let anybody hurt him." 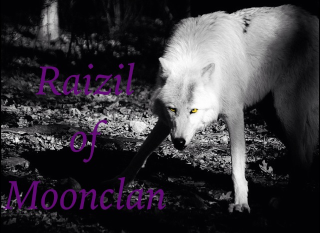 Raizil's eyes turned a yellow color of her wolf and her claws extended. She stood before Kenji and brushed the blanket aside do she had access to his neck. She use two fingers to mark him but at the last minute the boy turned his head and she instead got the edge of his cheek. "From this day forward Kenji is now a pup of Moonclan." She watched as the scratch healed into a scar on his cheek. "Well Kenji your a little restless aren't you?" Jake smiled at Raizil. He sighed, content. As soon as Kenji was officially accepted and marked, he raised his head in a howl. It was nice, and after a moment, he brought his head down. "Welcome to Moonclan, son." He whispered, still smiling. Kenji cried from the pain of the scratch but they quieted down when it healed. Hearing his father howl strongly, Kenji tried to copy it but his came out sounding like the pup he was. Kenji reached up for his new mother. Raizil laughed as she heard Kenji trying to copy his fathers howl. She hoped that he didn't take too much after his father or he would be getting into a lot of fights. She saw Keji reaching for her so she brought he head closer to him, and let out a groan when he pulled her hair. She pried her fingers off her hair and stuck her finger in its place. She then gave him a kiss on the forehead. "Okay Kenji mommy needs to go into town now." She said and took her finger back. Rai gave her mate a quick peck on the lips. "I shouldn't be too long." She could feel a rage and darkness feel her that she almost collapsed from it. 'Casper...please don't do this." she thought to him. She was really angry at him but she would never start a war about it. "Meet me at the border Casper, we need to talk" she added to the king of vampires. She took off and threw a wave over her shoulder. And headed to the border. Jake watched with surprise as Raizil began heading towards the border. But he decided it would be better if he left her alone. He needed to take care of Kenji. He sighed, tickling the child, while walking to the dens. Lilou, approaching the clearing slows to a walk. She finds a nice sunny spot to rest. She lies down and basks in the warm sunlight. Raizil arrived at the clearing to see Lilou laying there she walkes over to her and gives her a greeting. "hi Lilou. " She said to her clanmember. But then she caught the scent of her Beta who she needed to speak with. "Sorry but i must go, please excuse me." She said and took off in the direction of silver creek. Kari approaches the edges of the camp clearing. She hops into a bush and peeks to see the surroundings. She sticks her nose up out of the bush and takes a sniff and she smells the lingering scent of a few female wolves and a couple males. She yawns quietly and she collapses, almost instantly falling asleep behind the bush. Jake pounded into the clearing. He had stopped for a short break halfway here from the place he had made a tiny den, and where the two vampires had been. Raizil would see how strong he was! He would show her! But, he couldn't go marching into the vampires territory with Kenji. He looked around, and placed Kenji in the clearing. He howled loudly once, then quickly ran off towards the vampires territory. Kenji didnt quite understand all that was going on. Plus he was really sure how to get back to the dens. Kenji was taking away from here when he was really young. Kenji was about 5 years old. And even though he could walk and run he wasnt as fast hence why his father carried him. He missed his mom and clan a lot but being a rogue came with its good sides too. Kenji was pretty smart for a five -year-old. Its just adult stuff like this was way beyond his comprehension level. He did know that he needed somebody to come find him, so Kenji shifted and howled as loud as he could. Which if you weren't near by. You wouldnt be able to hear him. Kari blinked a few times before fully waking up. She yawned and looked for where the howling was coming from. She heard a loud one and the a few minutes later a soft howl. She peeked her head out and spotted a little pup. She smiled widely and hopped out to the pup and tumbling onto her back playfully. "Hey! What's up little guy?" She said laughing playfully. Kenji backed up and growled in warning at the she wolf. Fire swirled at the bottom of his paws. His father had showed him how to control his power somewhat but he was far from mastering it. "Don't come any closer loner. What are you don't on my mamas land?" Even though the alpha of Moonclan was his mother he also was a loner but only because his father took him away from the clan. But now that he was back technically he is an alphas son. Kari rolled onto her tummy and layed her chin onto the ground. "Awe! Your so cute!" Kari yelped happily. Her eyes started changing into a mixture of blue, purple and pink. Her ears then perked up. "Someone is near..." She muttered to herself. "Hey is this place like near your cave? Wanna go somewhere else to play instead?" Kari asked Kenji, her tail going in between he legs slightly. Kari smells a male nearby that was apart of this little one's tribe. But it wasnt the same male that dropped him off. Kari started to get worried and shaked a bit. Kenji watched the she wolf in wonder. He had never met somebody like her. If she was apart of his clan he knew she would probably hold the position of omega. She acted and looked as if she wouldn't be able to hurt anyone. The fire at Kenjis feet disappeared. "What are you scared about. And you never answered my question, what are you doing here? My name is Kenji, son to Alpha Raizil of Moonclan and Lone fighter Jake. And I don't think I will be going with you I must find my father. I don't know why we have came back to my mommy's home." Kari sat up from laying down and sniffied the air. 'I hope that male doesnt track me.' She thought to herself while shaking. "Well I got to go now so." Kari said silently as her ears listen. Kari scurried off, tail still between her legs, quickly back towards the forest somewhere. Kari soon scurried back into the camp clearing, trying to hide herself well. Kari spotted Kenji and snuck up to him. "Aye, Kenji. Who is in those dens at the moment?" Kari asked with caution but also curiousness in her eyes. Kenji was just about to take off to find his father when the lone she wolf came back. "The wolves in the dens are of Moonclan, you aren't allowed over there unless you are a member of the clan. Though you would have to talk to the Alpha about joining. Now if you don't mind I'm going to find my father, bye bye now." He said and took off towards the vampire territory. He was a brown blur as he moved through the trees. Kari shook her head as she watched him leave. "I'll just check myself then." She muttered and approached the entrance slowly and eventually entering.